It’s now been just over 5 years since equity markets hit their lows at the peak of the fallout from the banking/credit crises of 2008. A lot can happen in 5 years. This year’s crop of graduates entering the city were 16 and possibly sitting their GCSEs as the Fed was announcing QE1 back in 2009, and current generations of newly-qualified actuaries, accountants and CFAs may have only worked in the post-2009 era. When asset markets are recovering from such extreme lows as they were in March 2009, accompanied by copious stimulus from authorities its no surprise that opportunities arise to make outsize returns from investing in assets over the coming years. As we can see in the figure below (black bars), a number of asset classes have delivered returns of 14% or more annualized in the 5 years since 31 March 2009. What is also amazing is that by and large, this has been accompanied with low levels of volatility. Other than a couple of particular incidents (August-September 2011 being the most obvious example) volatility has been pretty low and we can see this by looking at the sharpe ratios of different asset classes (red bars in the figure), which illustrates the excess return divided by the annualized volatility. While developed market equities and high yield bonds have both seen exceptional returns of around 18% p.a. over 5 years, high yield bonds have done so with less than half the volatility (annualized vol of around 8%p.a. compared to around 15% for equities). This means that high yield bonds show a sharpe ratio of greater than 2 over that period of time, with equities still showing a sharpe of above 1, much greater than the long term average (over 10 years for example, the sharpe ratio of equities is around 0.3). Higher rated investment grade bonds have also done better than equities in risk adjusted terms over this period, with US investment grade bonds delivering excess returns of 6.5% on average per year off a very low volatility of around 5%. 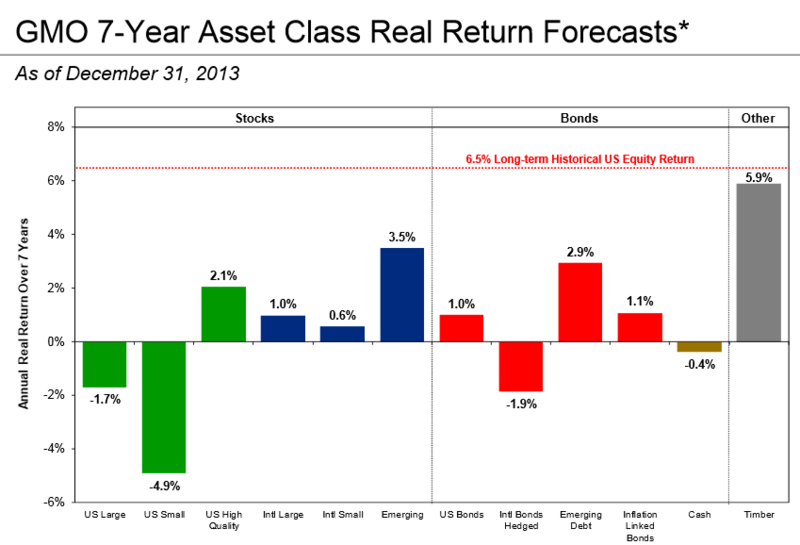 Asset classes that appear less flattered by the returns in the last 5 years include emerging market equities, which have delivered excess returns of around 14% per annum over that period, but with a higher volatility meaning their sharpe ratio at 0.6 appears below that of other asset classes, but still well above what we would expect for most asset classes over the longer term (over 10 years most assets have sharpe ratios below this). Commodities, as measured by the DJ UBS commodities index have seen modest positive excess returns of 3.9% per annum from a volatility of 16% showing a sharpe ratio of 0.24. 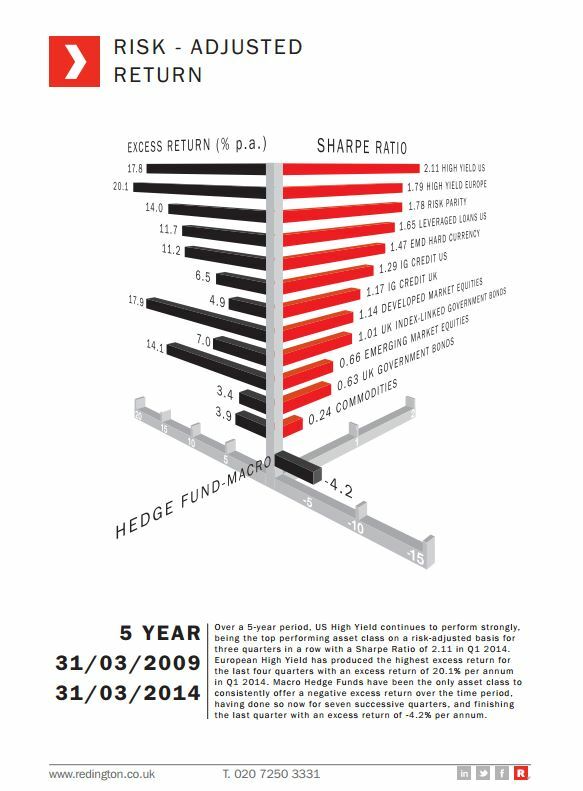 Hedge funds as measured by the HFRX Macro index have seen negative returns over the period but there are several shortcomings with using that index to measure hedge funds as a group and the returns within the universe will vary widely. For some asset classes, such as fixed income we can be fairly sure about future returns (at least on a hold-to-maturity basis) which we can derive from the current yield on the bonds less an adjustment for future defaults. 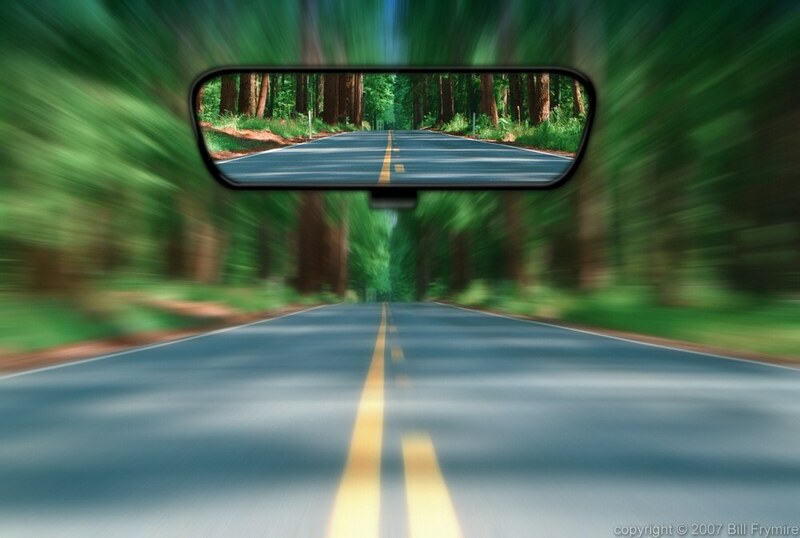 More or less without exception in the fixed income universe we can confidently say that returns over the next 5 years are likely to be substantially less than those seen over the last 5. Investment grade bonds, for example, are trading with credit spreads around 0.8%-1%, meaning that after allowing for a small amount of defaults the expected excess returns on a hold-to-maturity basis are around 0.7-0.8% per annum. Lower quality high yield bonds have higher yields around 2.8%, but allowing for historic levels of defaults reduces the expected return to the same or lower than that of investment grade bonds. For equities of course, the job of forecasting future expected returns is always a difficult one, over the very long term studies show that equities have delivered inflation-adjusted returns of around 3-4% per annum, albeit the actual return over any given sub-period (even quite long ones) is devilishly dependent on the start and end points (something which is brilliantly illustrated in this chart). Put simply they foresee negative real returns from the broad US stock market over the next 7 years, and only very modest positive returns of 1 or 2% per year from particular sectors. The rate emerging markets as the best opportunity but even there, the forecast return of 3.5% per year is well below long term levels. As investors we can’t live in the past and the fact that we may or may not have participated in the exceptional returns over the last 5 years is less relevant to what we should do over the next 5 years. The future is uncertain but what lessons can we take away in order to make the most of whatever environment presents itself over the next 5 years?